ARLIN REPORT THOUGHT OF THE DAY: REMEMBER ME? Maybe you don’t care to. I haven’t written much lately. There is only so much you can write about protests, protesters, the media, on and on. The patterns pretty much stay the same, pretty much come from the same side……left. I’m tired of writing about the snowflakes…..would like that word to go away, go back to being a normal winter element. I could write about President Trump, but I prefer to give him a chance and see how things fall. Its only been a small sample, even though he has been very active. I will say he is doing much of what he spoke of doing during his campaign. Won’t say much about Hillary and Gowdy……… where that goes, will see how that plays out as well. Will just say no one but no one is or should be above the law. Anyway, I haven’t had much to say…….I’m in a thinking mode. MISLEADING TITLE: Gowdy didn’t say it! This quote below from the link above. “I would like to apologize for the misleading title, I am sorry y’all. I couldn’t help myself. After all, it is not often that you see that Gowdy will have unlimited support and backup from President Donald Trump (unlike Obama). I made comments to a reblog of a similar post, I had some doubts whether Gowdy actually made the remark “…….Obama no longer my President……..and that Hillary will be charged.” To me it made no sense that Gowdy would take the chance of such remarks before Obama left office, igniting a possible pardon. When I clicked publish (to reblog)……..I even thought to myself “I should have said…. if in fact he even said it.” But I didn’t…..my mistake, I should have. If you don’t know for sure, you should say …..”I don’t know for sure”. I’ll try to DO BETTER. Hillary and her supporters believe that the Gowdy led Benghazi Investigative Committee is nothing but a Witch Hunt to keep Hillary from the Oval Office. They would not necessarily be wrong, but then so what. They know it is more than that. Hillary will do what Hillary does best. Going before a committee and tell a story filled with lies. It works for her, she is an habitual pathological liar; they easily come across as truth tellers. She knows they are lies, but she can cause the subconscious mind to believe it to be true. The subconscious accepts everything as fact that is fed by the conscious mind. Yes, even Hillary has a subconscious………but an evil conscience. I truly believe, this select committee has an honorable goal, to find the truth. Gowdy knows he won’t hear it from Hillary, he knows what she is, but he’ll have her perjury on record in front of all America. As for the Witch Hunt? So what. A successful hunt could save We the People from having Witch Hillary occupying our White House. That could be the Committees’ greatest service to our country. The effect of Hillary’s testimony is yet to be seen. She is a lawyer, she bought herself more time. That may be all. WOULD YOU PUT YOUR LIFE IN HILLARY’S HANDS? Of course the Democrats want the Hillary emails to go away; particularly Hillary and Bernie. I wouldn’t want to deal with it, if it were me either. But, Hillary must be held accountable for the risk, and there were most certainly high risk to national security. They say there was no risk. That is ridiculous, there certainly was. We know there were nations and probably terrorist groups to attempted to hack her server. It doesn’t make any difference if they were successful or not, the fact there were attempts, put the information that was or could have been retrieved at risk. If Hillary is dumb enough to do it, and she was, someone is smart enough to break into it; she was hacked. Now about Benghazi: Suppose, and this is likely; Ambassador Stevens emails Hillary, or sends word by any means that the situation in Benghazi was dangerous, and he asked for help. 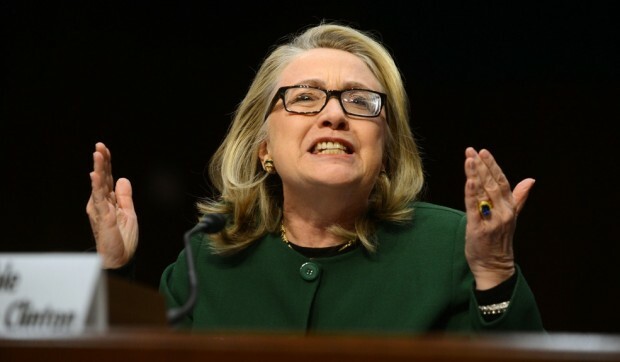 Hillary emails the Ambassador, there was no help coming, or other messages were sent to Hillary’s State Department team as well as Obama, with information that could place he Americans in Benghazi were in a vulnerable position if in the wrong hands. Terrorist hackers could easily have found out. The attack was on! Whether it happened or not, Hillary placed our people and the security of our nation in jeopardy. Those 4 Americans murdered, were part of our security that deserves defending.